We provide organisations with high quality defensible research to meet urgent needs without compromising rigour. Using qualitative and quantitative research and analysis we assist organisations in solving sensitive and complex problems. These could be related to policy change or development, reform, culture change, or targeted issues such as leadership, workplace bullying and diversity and inclusion. We provide Defence and defence industry with high quality defensible research to meet urgent needs without compromising rigour, to solve sensitive and complex problems including policy and culture change. 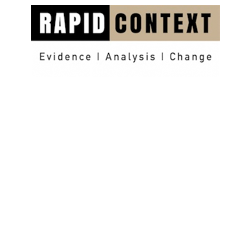 Rapid Context is a research consulting firm built on the premise that academic rigour and rapid delivery can enjoy each others company. We are passionate about robust and defensible research and about translating that evidence into policy and change. ​ We believe that better thinking produces a better society, and we are committed to developing solutions that are tailored to your context.